Smartphone genes. 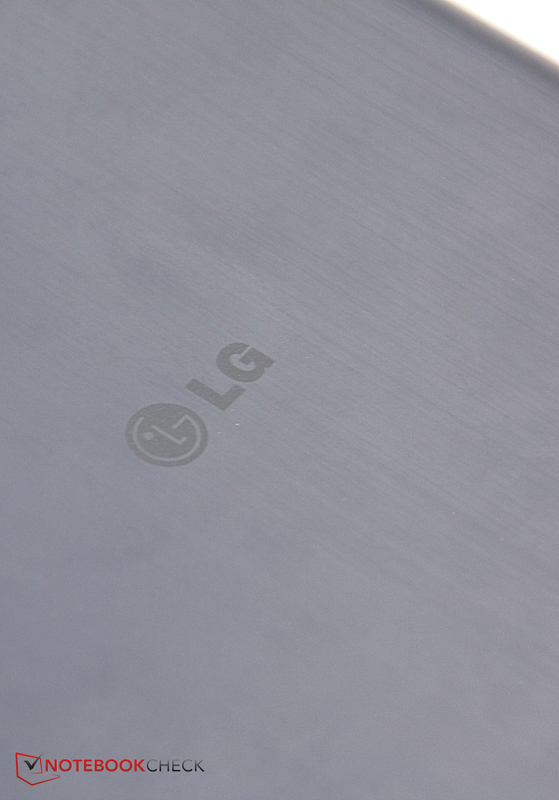 LG promises that you will find many features of the LG G2 in the G Pad 8.3. The smartphone got a "very good" in our review at that time. Now we want to know how well the tablet derivative does. 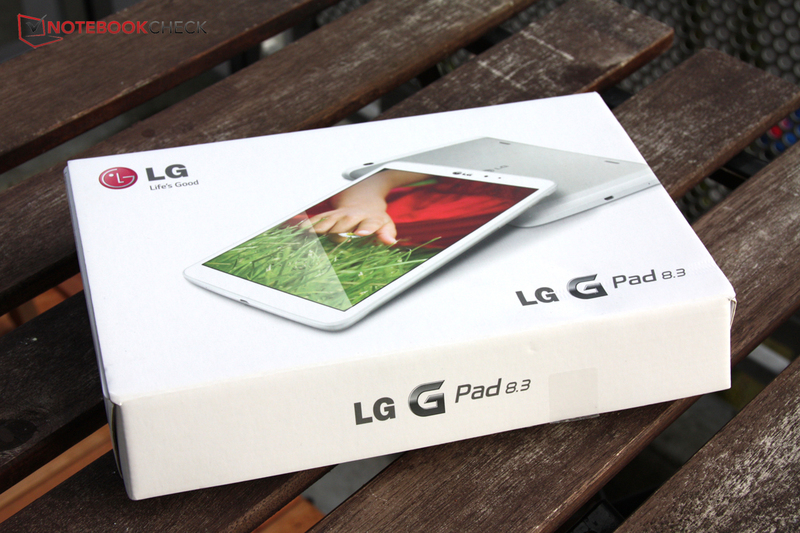 In review: LG G Pad 8.3. by courtesy of LG Germany. 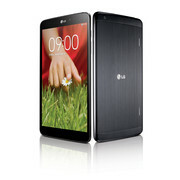 LG was insignificant in the market for some time, at least in the European smartphone and tablet market. However, this has changed with remarkable speed in the last few years. The cooperation with Google during the development of the Nexus 4 and Nexus 5 could have helped here. 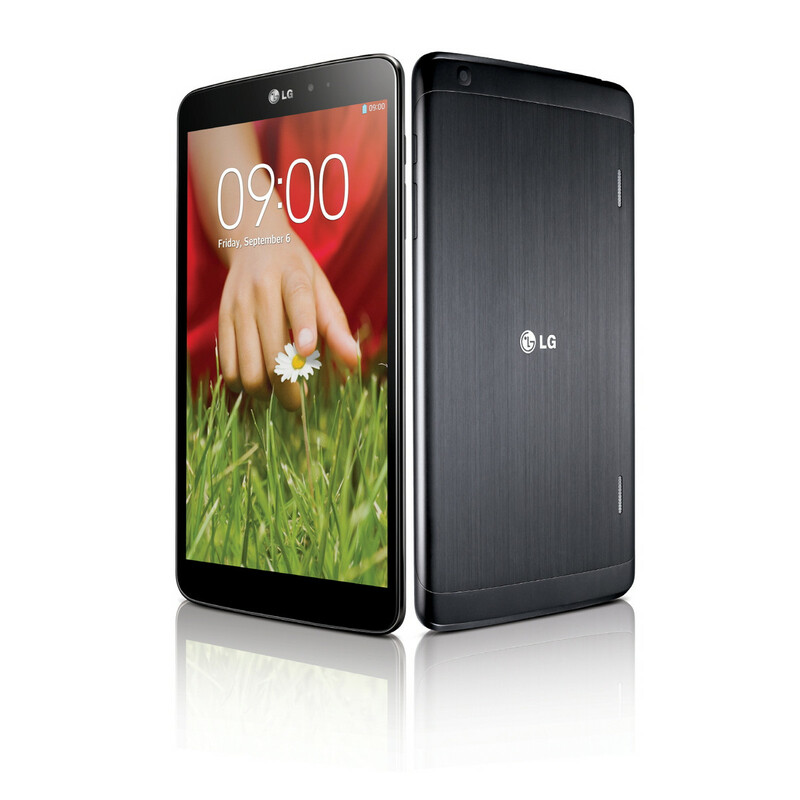 With the LG Optimus G and G2, LG produced two very high-end smartphones. The latter has evolved to a tablet called G Pad 8.3. The G2 and G Pad 8.3 have, to some extent, a similar shape. Both feature rounded edges and two speakers. In addition, the tablet took over the software from the smartphone and several convenience functions should help using Android. These were one of the reasons why the G2 got a "very good" rating earlier. 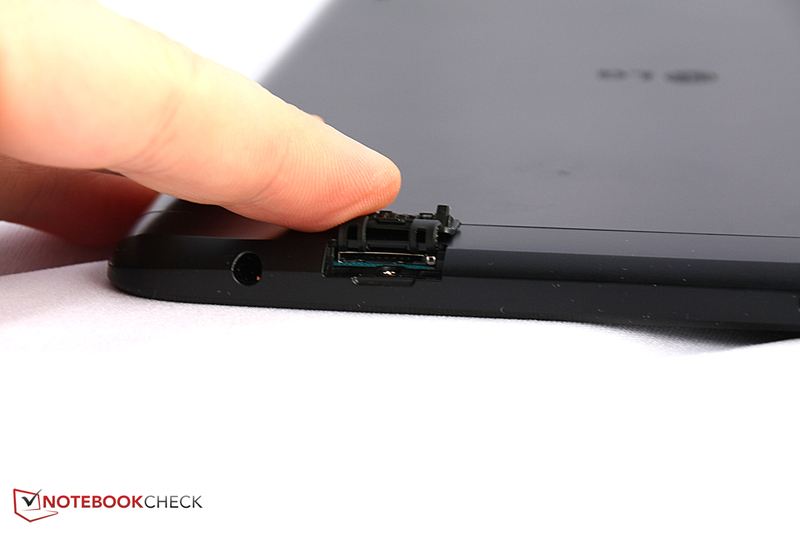 Let us see whether the tablet with weaker processor performs as well as the smartphone. The case is not outstanding, yet sturdy. The LG G Pad 8.3 is really sturdy: It does not warp from side-to-side-twisting, applying pressure on the rear side does not have an effect and most parts of the display did not show distortions when exerting pressure against the front side. Only at the far left edge (portrait mode) the liquid crystals can be seen when pressure is applied. The device, which can be optionally had in white or black, is elegant, yet not too extraordinary. Thanks to rounded edges, it is comfortable to hold. A narrow margin (7.2 mm; ~0.28 inches) surrounds the display on the left and right. The case is made from plastic. The rear side looks like brushed aluminum. With a height of 8.4 mm (~0.33 inches), the case is slightly bulkier than the Samsung Galaxy Tab 3 8.0's, but it is also a touch thinner than the Google Nexus 7's. Overall, the case looks very compact, especially because of the rounded corners. With a quad-core processor clocked at 1.7 GHz, the LG G Pad 8.3 offers a good price-performance ratio, at least on paper: Only the processors of the Amazon Kindle Fire HDX 7 and the Dell Venue 8 Pro feature a higher clock rates among our comparison group. Details about the actual performance are available in the "performance" section. 16 GB of memory are standard, but the HP Slate 7 or the Huawei MediaPad 7 Vogue, for example, feature less. The rear camera's resolution of 5 MP is average, but two speakers on the rear side are striking. Besides a Micro-USB and the 3.5 mm inch jack for headsets, there are no special interfaces. A microSD slot is hidden behind a small cover at the top edge of the case. We appreciate that LG apparently spent time and development effort to further improve the user-friendliness of the usual Android UI. It is even more pleasing that it largely works. The system is based on Android 4.2.2 Jelly Bean, which is not the newest version since version 4.4 is already available and with it many new features. 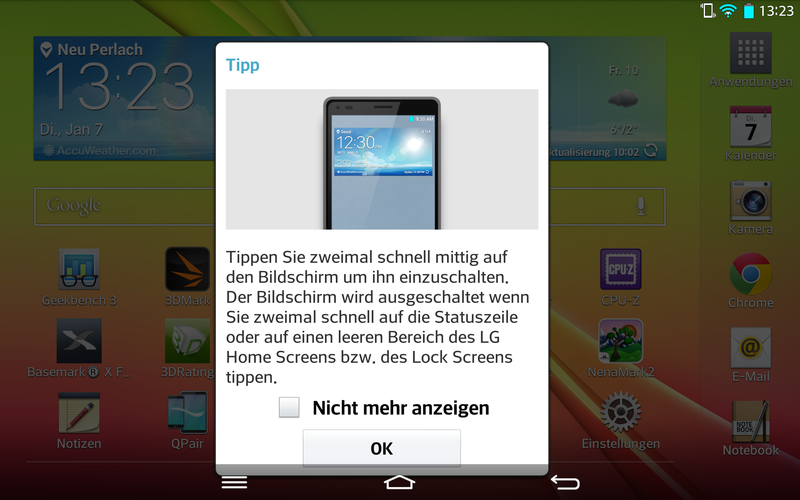 Furthermore, we have even already heard first rumors about Android 4.5. Therefore, the user has to do without several convenience functions. At least Android is still easy to use and responsive. - Multi-User: access to private data and certain domains can be blocked from other persons using the tablet. - KnockOn: the tablet can be reactivated from stand-by mode and stand-by mode can be activated by double tapping the screen. To summarize, those frequently running multiple tasks at once, will especially benefit from the enhanced UI. Acer and Samsung have already developed convincing solutions for their tablets, too. But, the KnockOn gesture is really reasonable, intuitive and handy. Among the additional apps and features, QPair is especially noteworthy. The tablet actually gets an enhanced smartphone with it: Although calls cannot be accepted, it allows rejecting calls during a meeting and directly sending the caller an SMS that you are busy at the moment. You can reply to SMSes from the tablet. Furthermore, you can continue reading links or watching videos recently used on the smartphone. 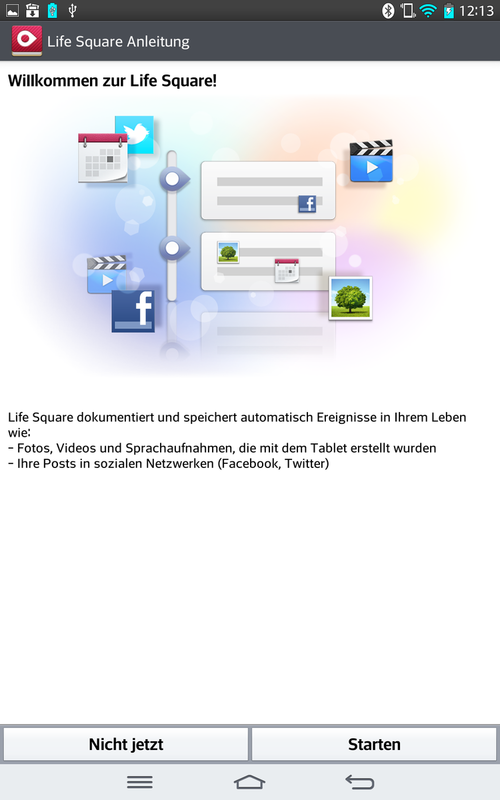 In addition, memos are synchronized between smartphone and tablet and Internet sharing is possible via QPair. Generally, the QPair app works on all Android smartphones, but several features might be limited. Furthermore, the LG includes Polaris Office5, a translator, and a video editor. 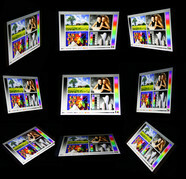 Overall, the software bundle is very extensive and quite useful. 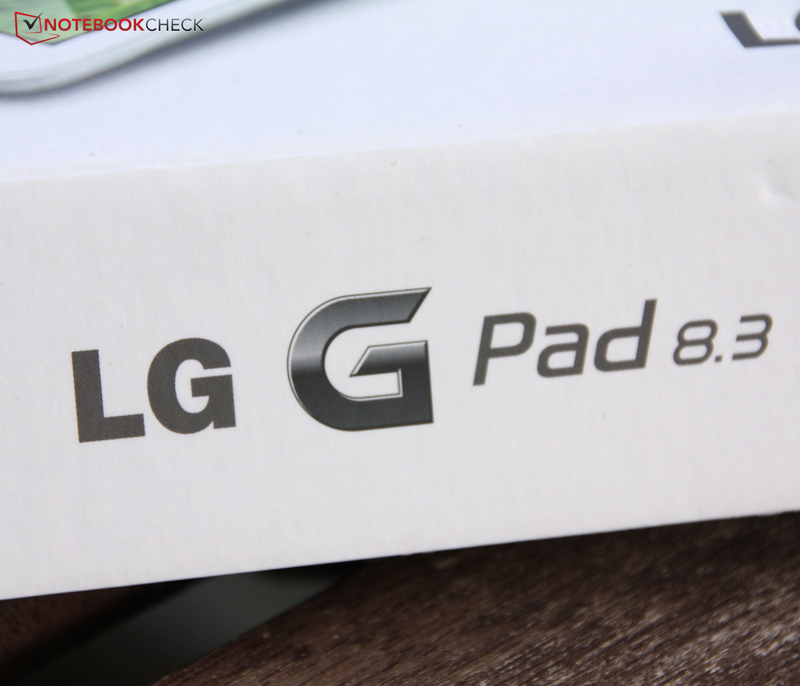 The LG G Pad 8.3 is only available without a cellular module, at least at the moment. If you also want to surf the Internet on the move, you will therefore rely on mobile hotspots or you had better buy another device. Wi-Fi standards 802.11 a/b/g/n are supported, while the new, fast 802.11 ac is not. 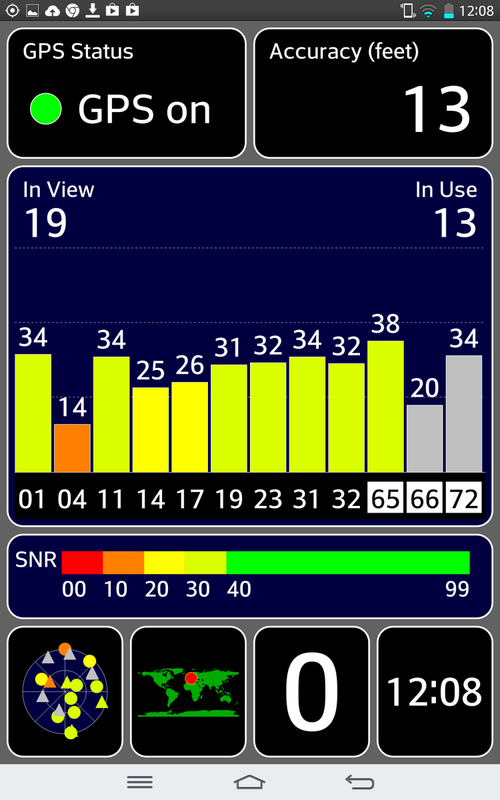 Both frequency bands, 2.4 GHz and 5 GHz, can be used. 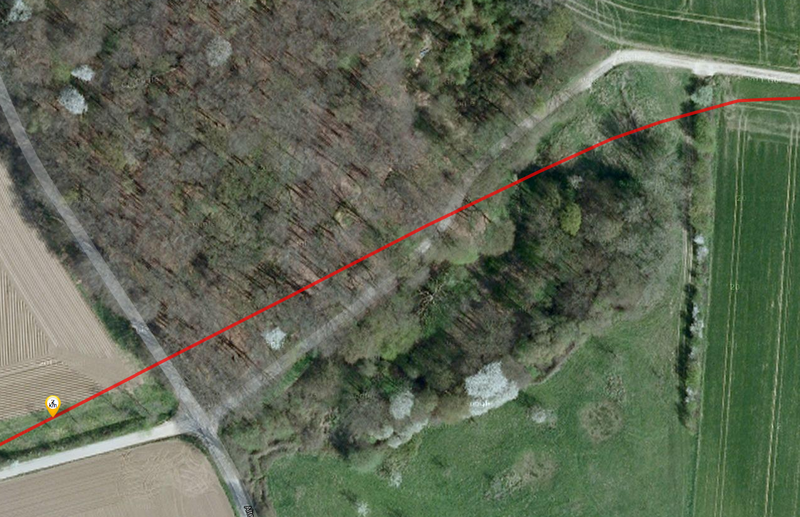 The reception quality is still good at a distance of 10 meters (~33 feet) from the router with three walls in between: 3 or 4 bars are still available. This is sufficient for fast page loading and surfing without problems. Bluetooth is also available, namely the current version 4.0. 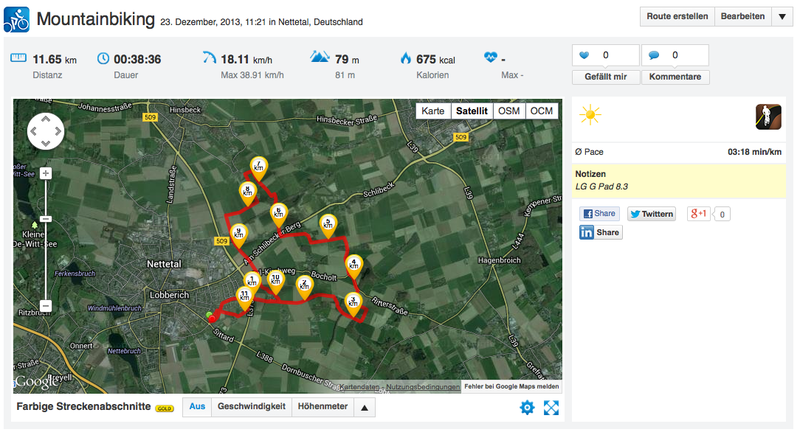 In order to test the GPS module of the LG G PAD 8.3, we took it and the professional navigator Garmin Edge 500 on a car ride. The route led us through a wood and over a bridge. 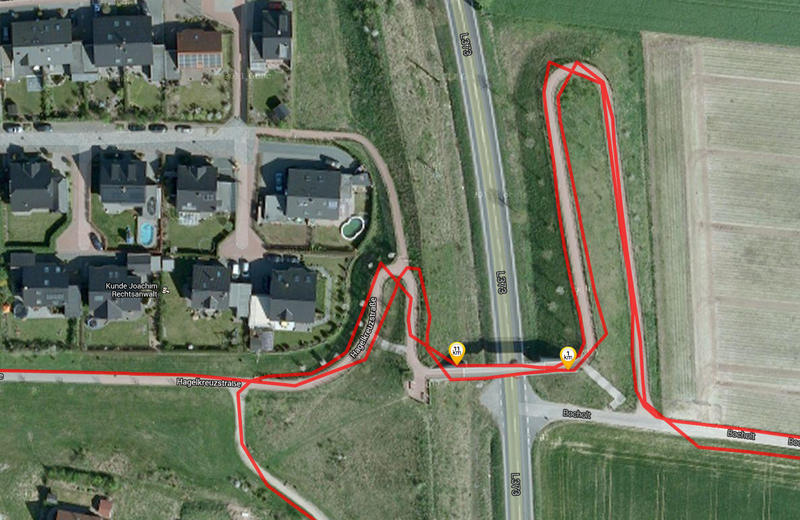 Unfortunately, the GPS module of our test device had serious problems. 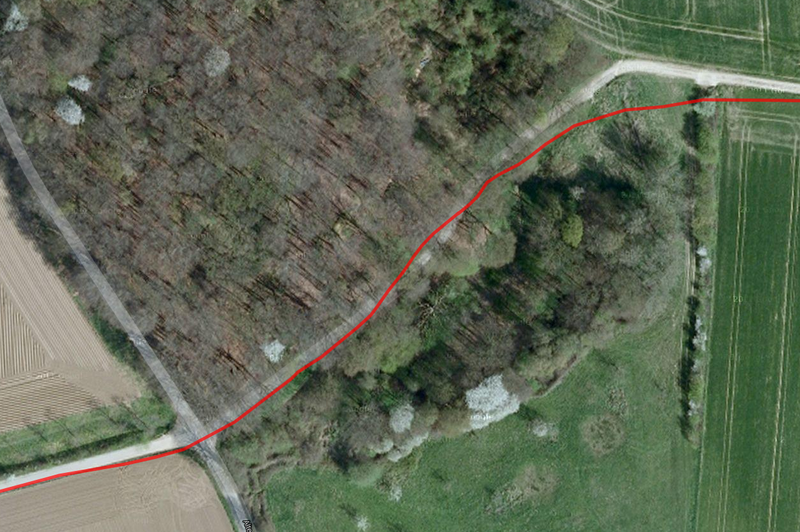 Especially the route through the wood significantly deviates from the route we actually drove. Crossing the bridge looks like we hovered over the crossing road. 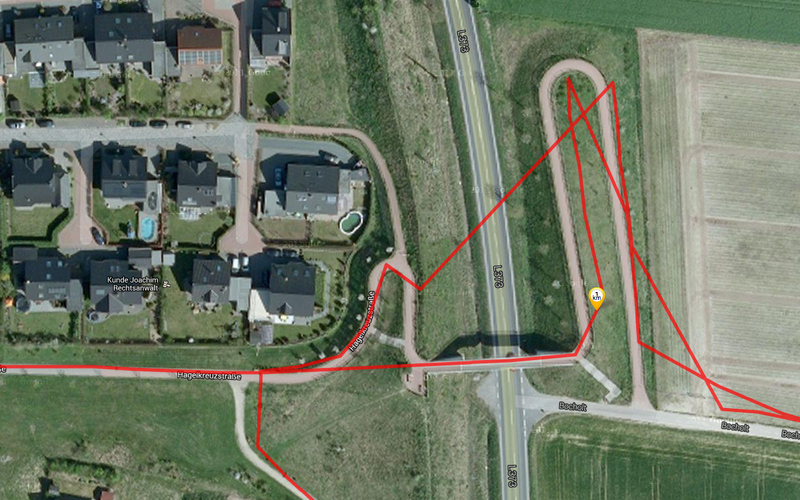 Finally, we tested the reception quality of the GPS module with the "GPS test". The result is good: Even indoors, it connects to satellites fast enough for determining the positions with a precision of 10 meters (~33 feet). Outdoors the accuracy increases to 3 meters (~10 feet) after a short time. The rear camera is quite inconspicuously incorporated in the top part of the frame. 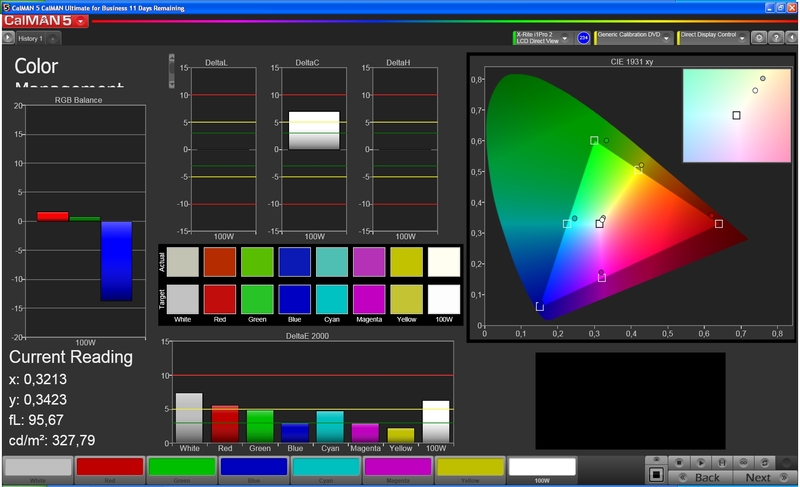 It has a resolution of 2560x1920 pixels, i.e. 5 MP, and does not feature an LED-flash. 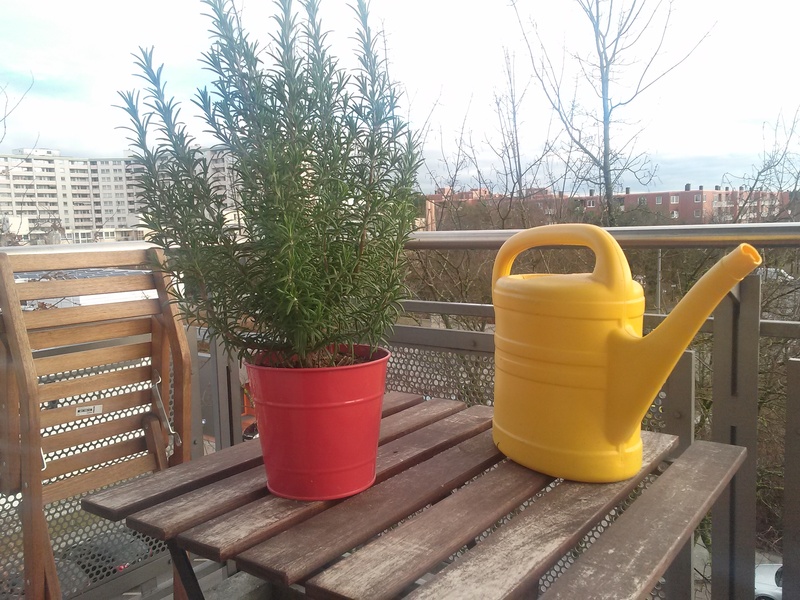 The colors of the photos look slightly dull and the images quickly get noisy in bad lighting conditions. The sensor masters back-lit photographs quite well, but bright areas often look too bright here. 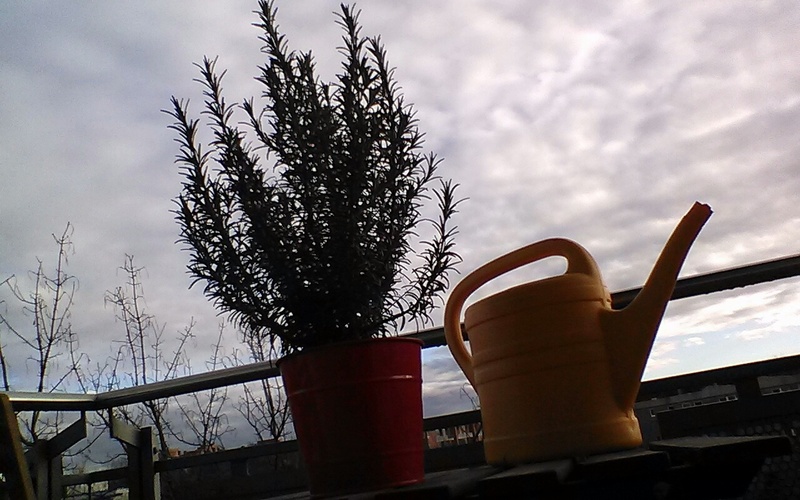 The front camera does not shoot good photos, but it is sufficient for video telephony and popular "selfies". Only the usual accessories are included: data cable, USB charger, quick guide. You will not find specific accessories for the G Pad 8.3 on LG's web site, but you can buy generic add-ons, e.g. portable batteries, which allow charging the tablet on- the move or a mobile printer. The included warranty information reports a warranty period of a maximum of 27 months from the date of production and 24 months from purchase date. You can register for repairs via a hotline or online via their website. The capacitive touchscreen of the LG G Pad 8.3 works reliably. This is also true for the corners. The surface is pleasantly smooth. All Android functions work reliably, only the "KnockOn" gesture added by LG, which allows waking the tablet from stand-by mode, should not be done too quickly. Thanks to the display size, typing on the virtual "LG keyboard" is very comfortable. 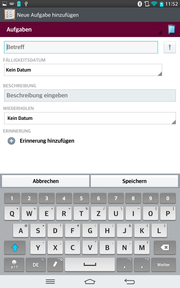 The usual Android keyboard cannot be selected, but, this is not a big problem, since the LG version is intuitive. In addition, there are many smileys, emoticons and symbols, with which you can create colorful emails or other messages. 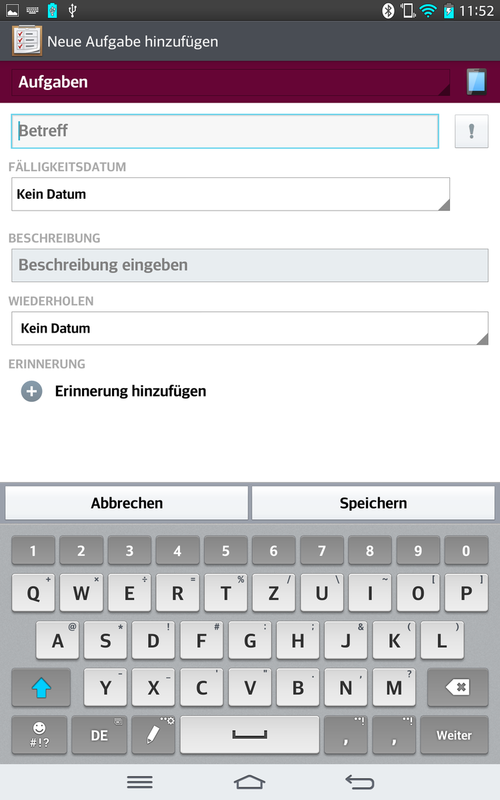 LG also provides many other input options: handwriting, voice input, or swiping over the keyboard. You need to get used to them first, but they are useful in some situations and work quite reliably. LG uses an 8.3-inch IPS display with a Full HD resolution (1920x1080 pixels), which outperforms many competitors'. Only the Amazon Kindle Fire HDX 7 and the Google Nexus 7 also feature Full HD displays. Distribution of brightness as well as brightness are poor. With an average brightness of 291.7 cd/m², the G Pad 8.3 performs worse than all comparison devices: The average brightness of the Google Nexus 7 display is above 200 cd/m² higher! A brightness distribution of 78% is very uneven. Such brightness differences can be seen with the naked eye in big white areas. Contrast and black value are fortunately acceptable: The black value of 0.45 cd/m² is better than most test devices' and the contrast of 731:1 is average. The image benefits from these: Colors look crisp and strong and dark colors do not look grayish. 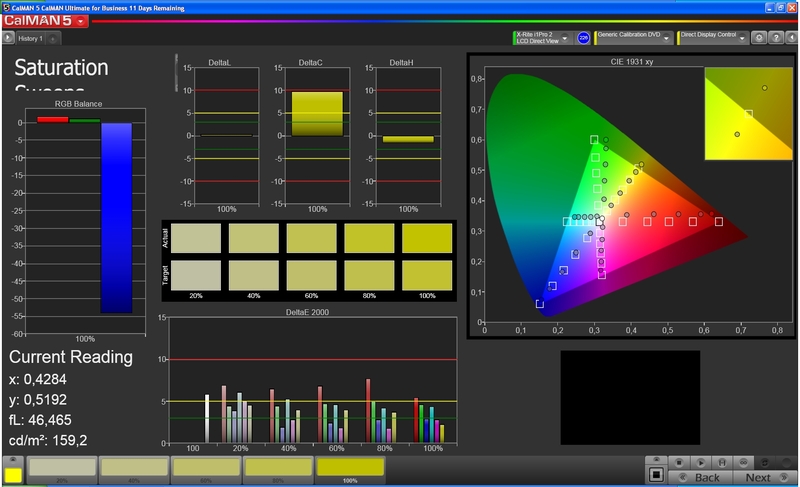 The results of our measurements with the colorimeter and the CalMAN software are also quite good: Although the colors do not precisely equal the values of the reference color space, they are quite close. 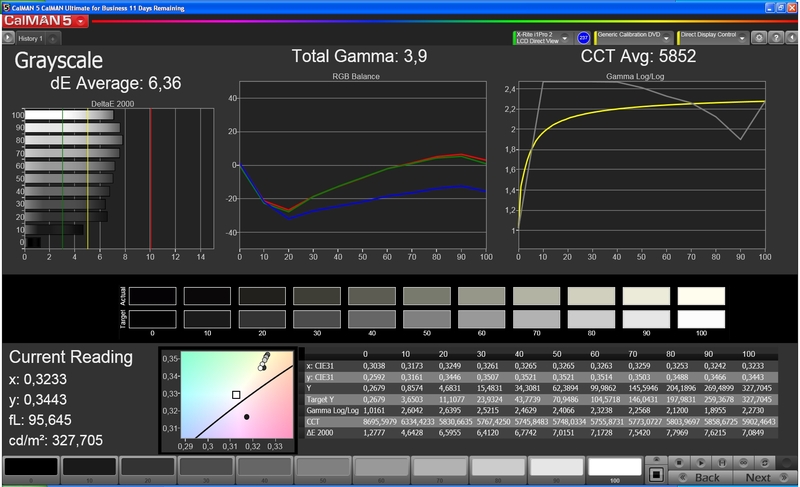 An average deviation of 5.08 gives an acceptable color precision, although most comparison devices perform better. Especially red colors deviate too much from the reference value. 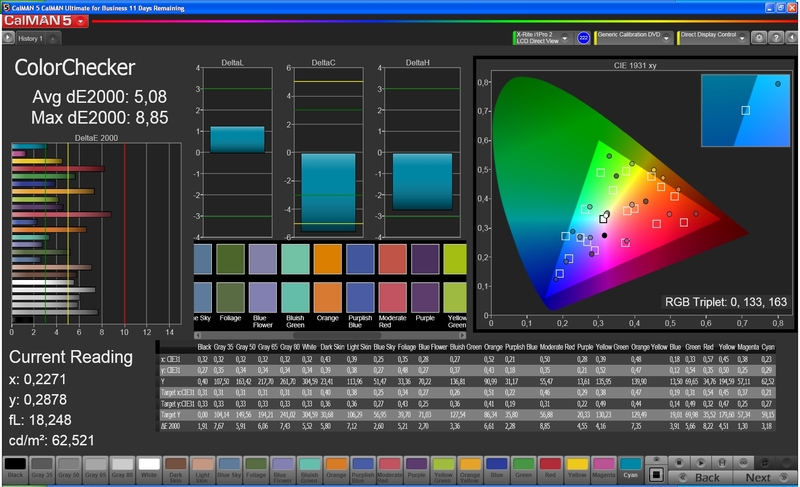 The display is not bluish because blue colors are under-saturated. As a result, red colors often look closer to orange. 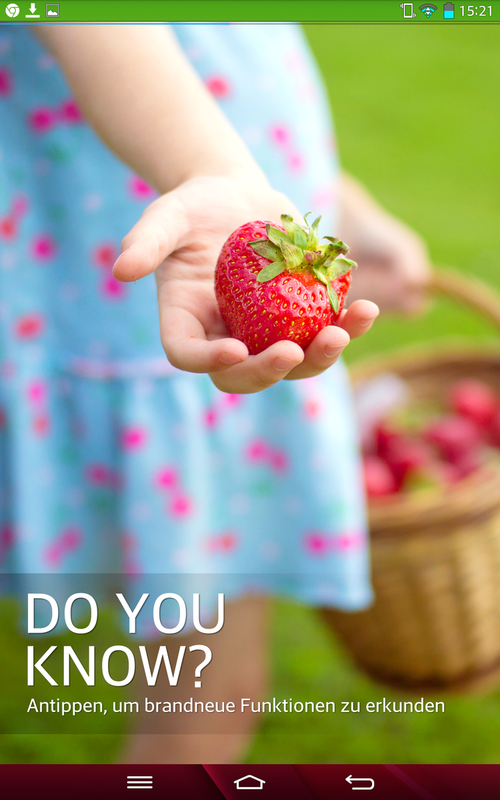 It is difficult to read from the screen in bright environments because of the low brightness and the glossy display. 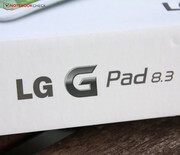 But, we did not face problems with the G Pad 8.3's display indoors. 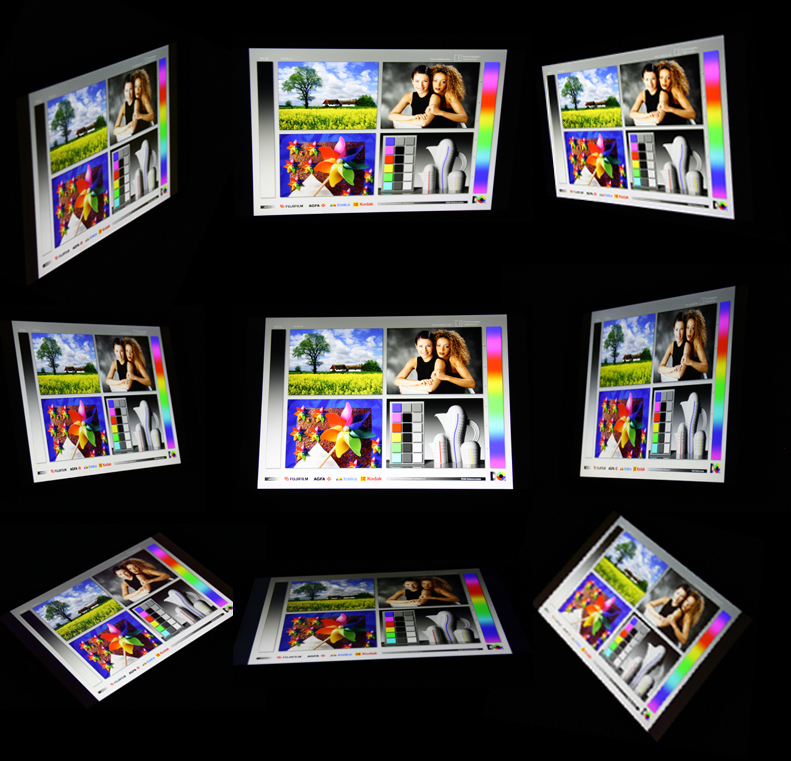 The IPS technology allows wide viewing angles. This is also true for the LG G Pad 8.3. The viewing angles are bigger from top to bottom than from left to right in portrait mode. However, the image only gets darker at extremely flat angles. As already mentioned above, The G Pad features a quad-core CPU with a clock rate of 1.7 GHz from Qualcomm. It is called Snapdragon 600 APQ8064T and is slightly slower than the Snapdragon 800, which is used in the high-end smartphone LG G2. Nevertheless, the strong CPU performance and 2 GB of RAM should be more than sufficient for most apps. LG’s highly advertised multi-tasking worked without problems in realistic scenarios. The performance is actually quite high in system benchmarks: Only the CPU of the Amazon Kindle Fire HDX 7, with a clearly higher clock rate, is faster. 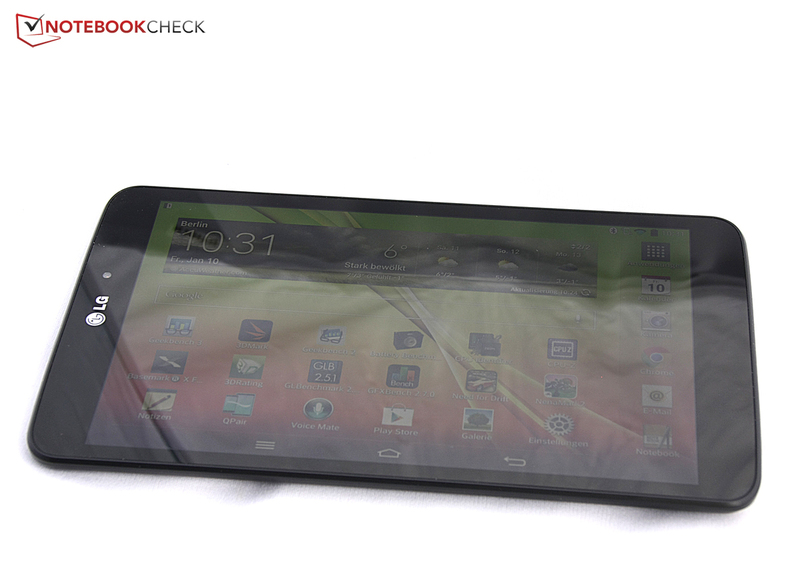 The G Pad 8.3 is more or less on par with the Google Nexus 7. Google's tablet performs slightly better in 3D benchmarks. However, none of the other comparison devices can keep up with the performance of the G Pad. If you like surfing the Internet, the Amazon Kindle Fire HDX 7 might be your first choice, but the G Pad comes right after it. LG's tablet performs very well here. Finally, the G Pad 8.3 is average in terms of access times and transfer rates of the hard drive. Overall, it is impressive that the Nexus no longer is the only device with extremely good performance for a low price. Meanwhile, LG's G Pad can easily keep up with the Nexus 7 and outperformed several competitors. 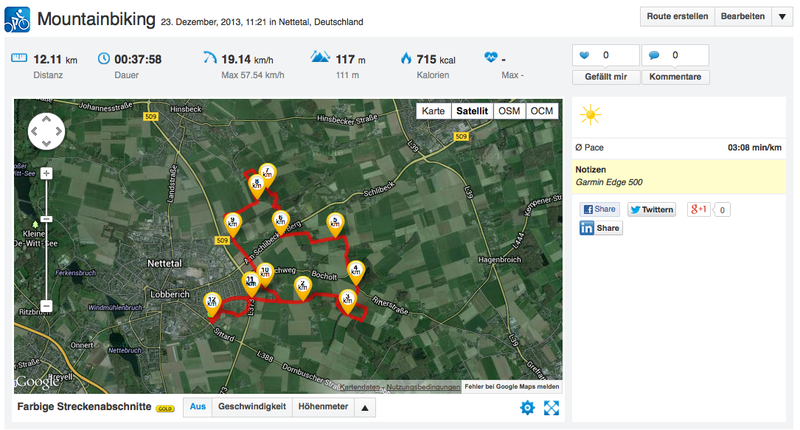 In practice, navigation is fast, multi-tasking is smooth, and the browser loads pages quickly. How about games? 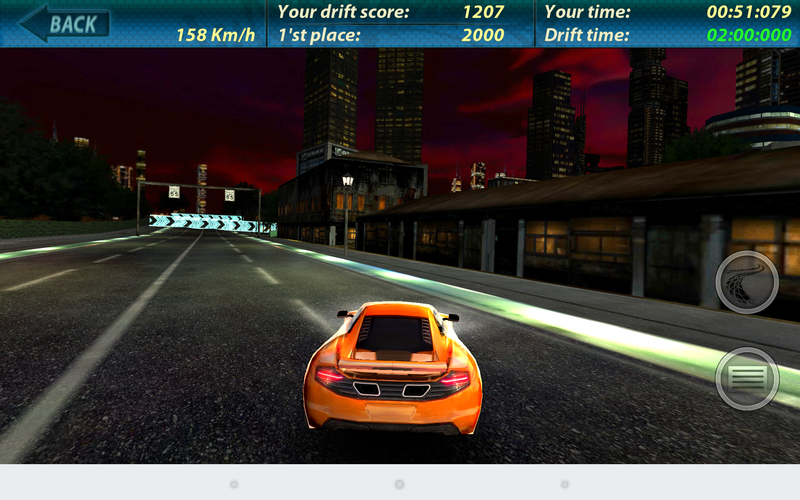 The benchmark results are encouraging and so, we ran several of the most popular titles from the Google Play Store. We expected that "Angry Birds: Star Wars 2" should run without problems from the start. 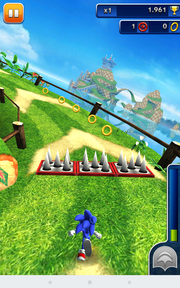 Even more demanding 3D games like "FIFA 14" or "Sonic Dash" ran without problems. And we even did not face problems with 3D shooters or fast 3D race games including "Shadowgun: Dead Zone", "Need for Drift", "Real Racing 3" or "N.O.V.A. 3": The games always ran without stuttering and loading times were pleasantly short. 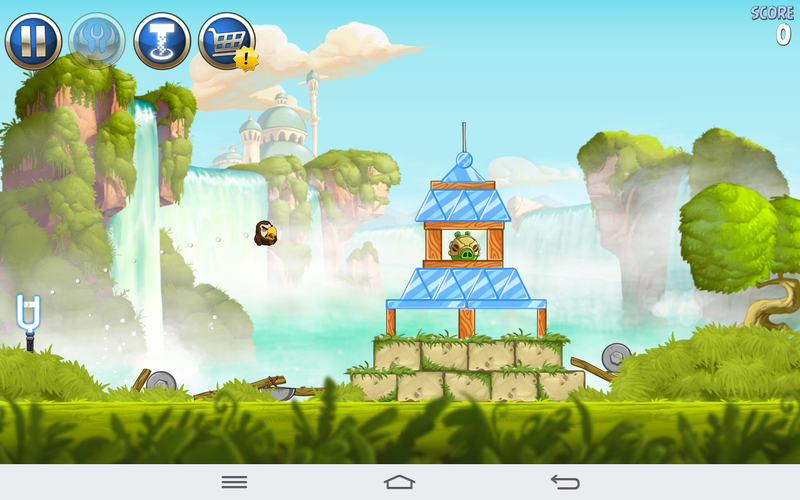 Naturally, 2D games like "Angry Birds: Star Wars 2" run. But, the performance is also sufficient for 3D games. 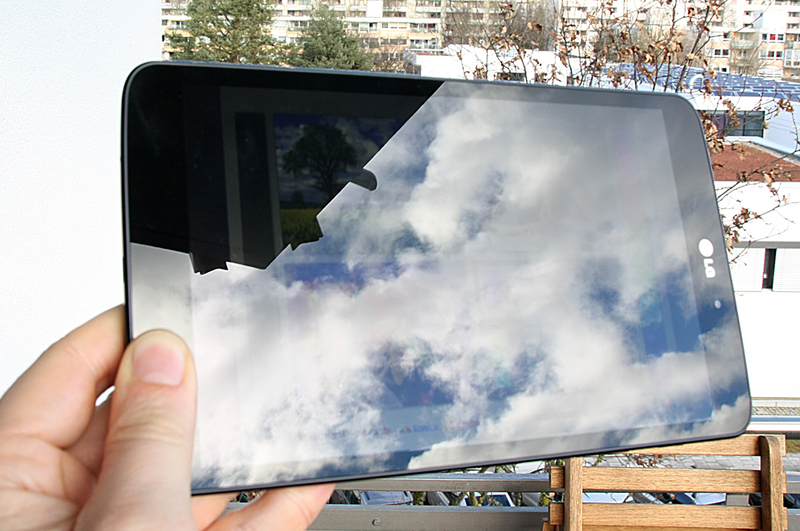 In landscape mode, the tablet always remains comfortably cool on average. As the performance components are obviously near the edges, the G Pad 8.3 gets slightly warmer there. The measured maximum temperature is 38.4 degrees Celsius (101.1 Fahrenheit). Are there tablets that remain cooler? Sure - e.g. 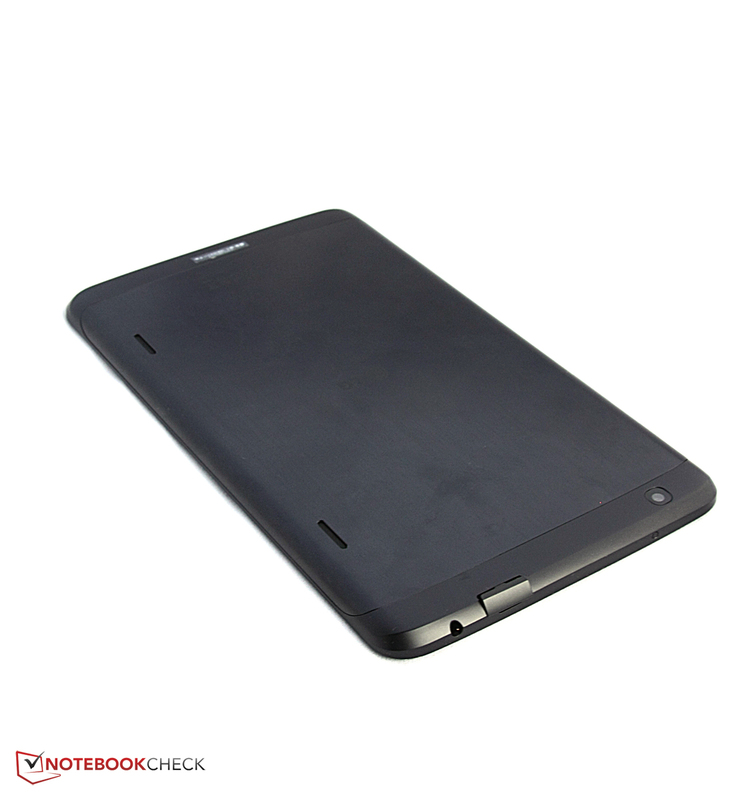 the Lenovo Yoga Tablet 8 in our comparison group. But, the Amazon Kindle HDX 7 performs better at the expense of a higher waste heat and gets significantly warmer than our test device in all parts. 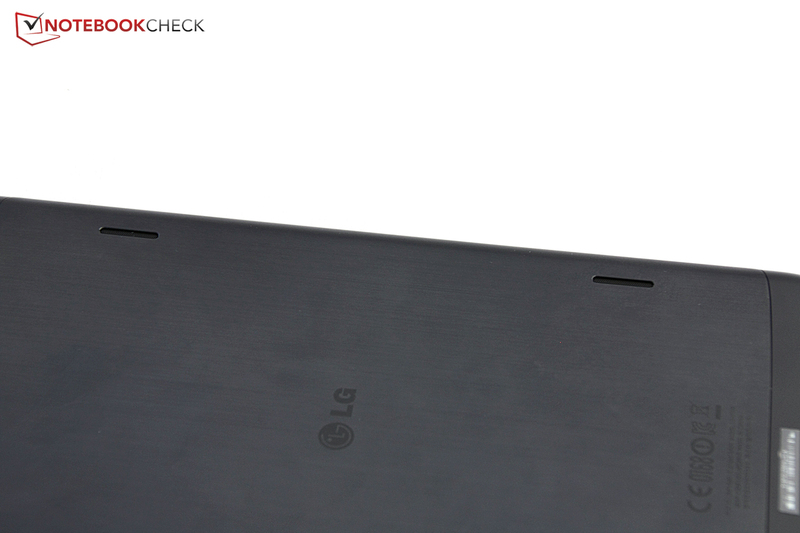 Overall, the LG G Pad 8.3 can be used comfortably in all scenarios and does not get hot. While idle, the tablet only gets imperceptibly warmer. 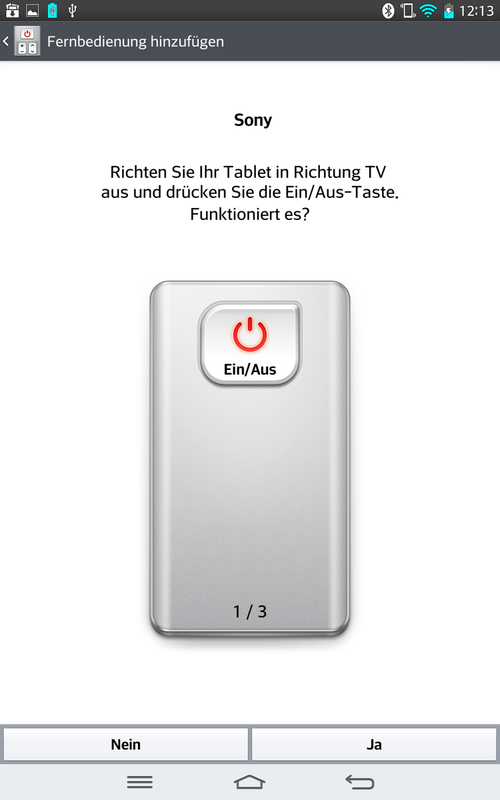 Two speakers on the rear side are promising: most tablets only feature a single speaker. The sound should at least benefit from the stereo effect: You can clearly hear whether the sound comes from the right or the left if you hold the tablet in front of you. The maximum volume is also remarkable: It is nearly too loud for the usual distance during everyday tasks. However, if you decrease the volume, the sound quickly gets significantly duller. It only sounds clear at the highest volume levels. Overall, the sound booms and is not precisely differentiated. Basses are actually lacking and high tones are over-emphasized. The speakers failed to leave a good impression. Having high performance, yet a rather dark display, the power consumption should not be that high while idle. 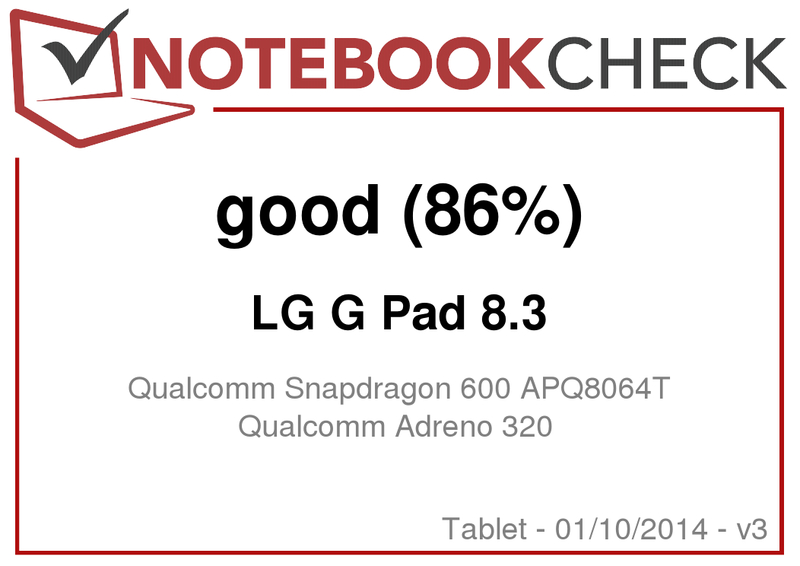 Unfortunately, the LG G Pad 8.3 is not exemplary in this aspect. It can only outperform the Lenovo Yoga tablet in the idle scenario; all other comparison devices require significantly less energy. Under full load, the G Pad needs a maximum of 7.6 Watt and so more than all other comparison devices. As a result, the battery life is not pleasing. The battery capacity of 17 Wh is slightly bigger than the Google Nexus 7's or the HP Slate 7 Plus'. 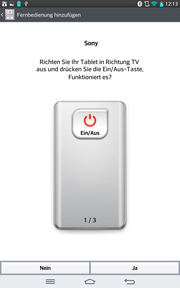 But this is necessary because of the high power consumption of the tablet. In all three tests, the battery life of the LG G Pad 8.3 is nearly always shorter than the comparison devices'. 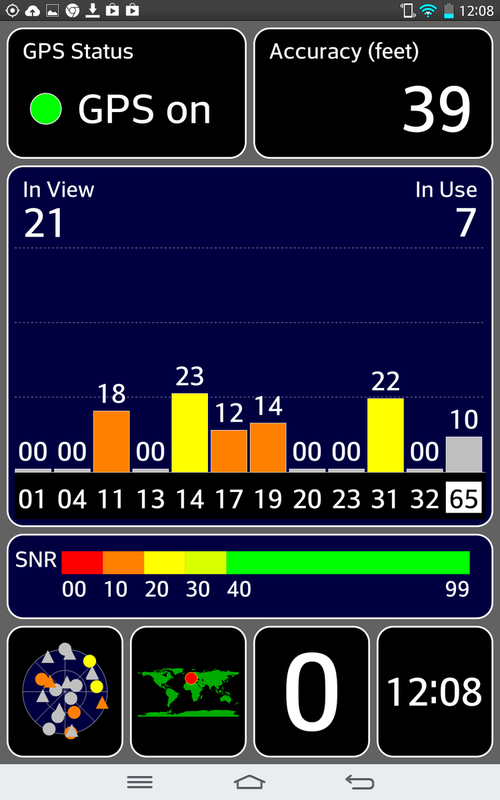 For example, our WLAN test ends after 5:16 hours on the G Pad, while all comparison devices last at least one hour longer. 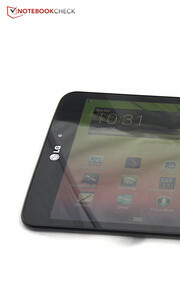 The LG G Pad 8.3 is powerful and slim, but its display is not bright. Thanks to its quad-core processor with a relatively high clock rate, its performance belongs to the upper class and is even comparable with the Google Nexus 7's. In addition, LG reasonably enhanced Android and included a good software bundle. We appreciate the reliable touchscreen, the sturdy and slim case, and the high-res screen with strong colors. Although the display is darker than many competitors' are, this is not a serious problem indoors. The speakers are not a delight. Since LG incorporated two speakers, they should have also cared whether these fulfill the expectations they raised. In addition, the LG does also not perform too well in power consumption, which is higher than usual. As a result, the battery life is just acceptable. Overall, the LG G Pad 8.3 is recommendable for those who usually use their tablet with headphones, indoors and not too far away from the next power outlet. These will get a more than solidly designed, fast tablet with Full HD display. 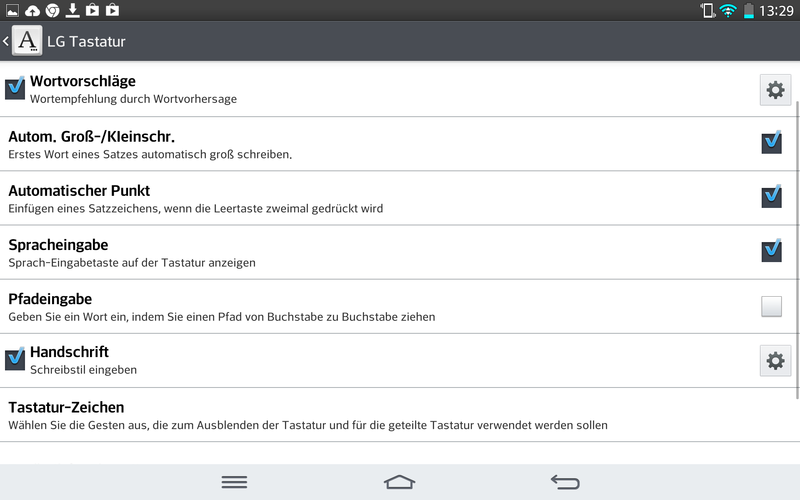 However, the Google Nexus 7 still has the better price-performance ratio. 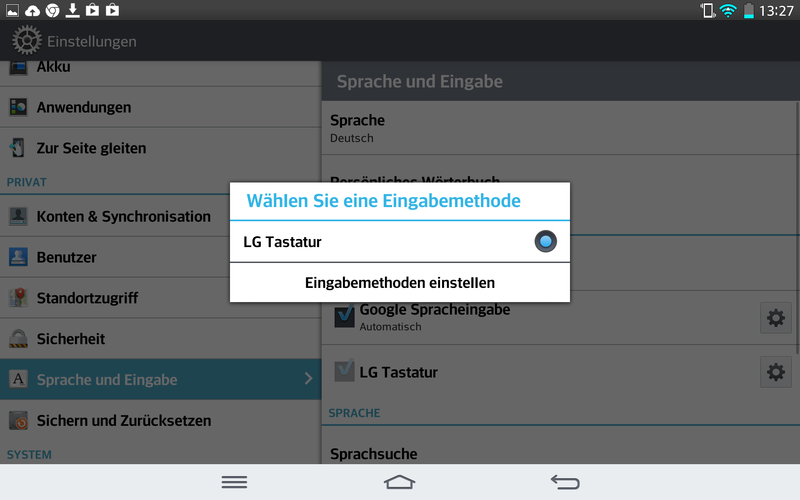 In Review: LG G Pad 8.3, courtesy of LG Germany. The LG G Pad arrived and has to go through our tests. 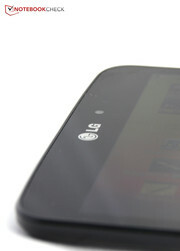 LG took over several functions of the successful G2 smartphone. Let's see, whether they perform that well in the tablet. The front camera is a fail, but is is sufficient for occasional video telephony and "selfies". Although the rear camera has a higher resolution of 5 MP, the images are not really good. The two speakers are the same as the LG G2's, but the sound quality is poor. So you will need the headset port on the top quite often. The tablet is slim and available in black or white. The rear side is made from plastic, but it looks like brushed aluminum. 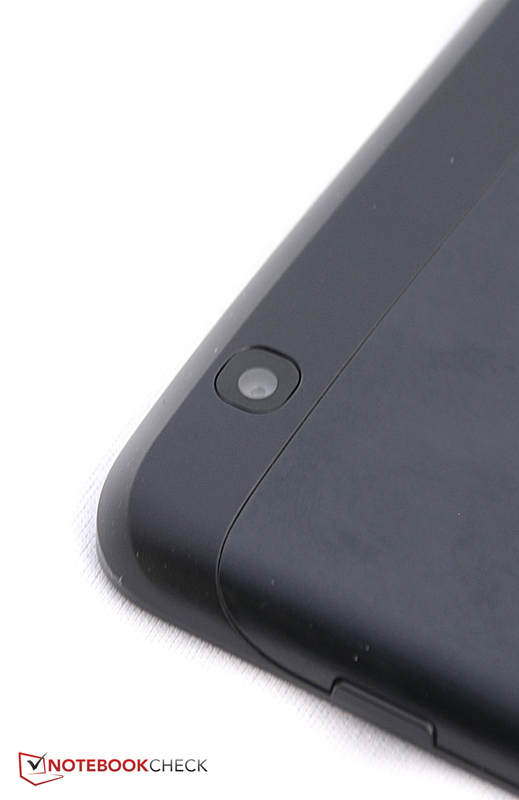 The microSD slot is hidden behind a cover on the top side. Overall, the case is very sturdy. The display features Full HD resolution, but it is not very bright. Both physical controls are on the right side. LG made several useful enhancements to the Android UI. A widget helps with the new functions. It allows watching explanation videos. 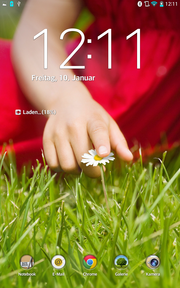 The user can decide whether to use the full screen of Android for this purpose. Swiping an app to the side with three fingers will start multi-tasking. The LG keyboard is the only input option. ... and in portrait mode. Further input options are available. You can e.g. input via the keyboard without lifting the finger. The performance of the tablet is more than sufficient for fast 3D games. There are several apps on the lock screen, which can be directly started. The remote control app is useful. Life Square keeps track of social media profiles. Overall, the LG G Pad is a good tablet, but the Google Nexus 7 continues to have the best price performance ratio. LG packed a lot of performance and a Full HD display into a cheap tablet. The screen should be brighter and the speakers should be better. How quickly other manufacturers took over Google's "cheap and good" concept.